Well, I guess the jig is up... summer is actually almost over. Boo! Considering that I really don't consider the end of summer to be until Labor Day, I decided to revisit my summer bucket list, and see which ones I still have left to complete. 2 | go to the county fair, and ride at least one ride. Well, I actually rode two rides! 3 | get some color- red does not count! I guess I burnt so much, that my burn turned to tan, and I have kept it for the majority of the summer. No looking forward to ghost white during the winter. 4 | go swimming at least once a week. When the weather was non-fall-like, we were in the pool at least once a week, but once the weather turned, there was no point, and the pool closed. 5 | wear shorts out in public I actually have done this a total of three times. I am EXTREMELY self-conscious, so this was a big deal. 7 | sit around the fire and roast marshmallows for s'mores. Mmmmm.... was completed twice! 8 | speaking of s'mores, go to Dairy Queen and enjoy a s'more blizzard. Oh man, this was amazing! 9 | grill out as much as possible- there is just something about burgers and hot dogs made on the grill that make them taste so good, and honestly, they don't taste like summer in the middle of a snow storm. 10 | read a book- I read alot of blogs, but I have a Chelsea Handler book that has been calling my name for the past two months. I am currently working on this! 11 | go to the zoo. 12 | enjoy some outside music. 13 | take a ride on a boat- this could include fishing, or it could include going to Chicago and taking a river boat tour through the city. So, if I'm counting right, I have completed 7 out of 13... which is really not a bad number, considering I have another week left of summer. 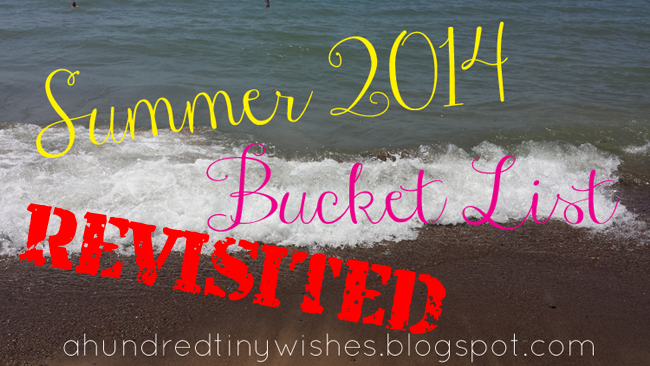 Have you completed your summer bucket list? I have a bucket list too, I love that im not the only one!